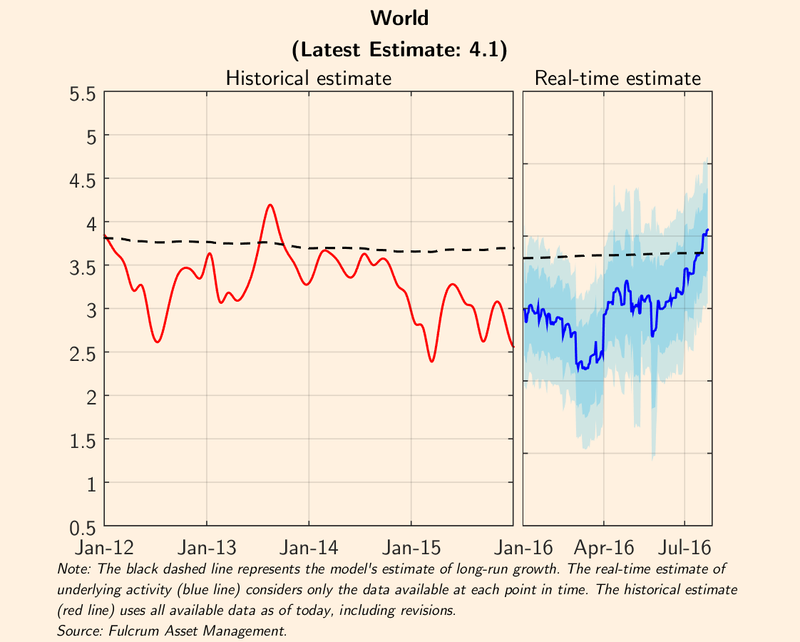 As I reported in a recent post, global economic growth has been slowing from its already below-average level. US economic growth has dropped away in the first half of 2016, along with weak growth in Japan and Europe, slowing growth in China, impending recession in post-Brexit vote Britain and continued recessions in Brazil and Russia, with South Africa and Turkey about to join them. Indeed, the US is growing at its weakest rate since 2010. 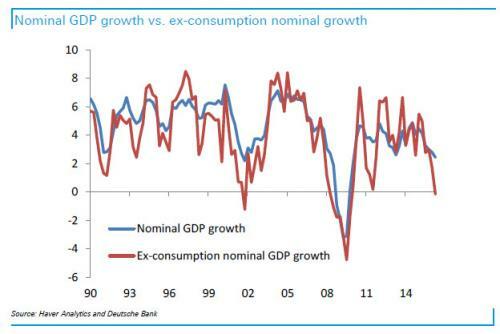 Worse, everything unrelated to consumer spending is suffering an outright contraction for the first time since the recession ended in 2009, according to Deutsche Bank. US business investment is dying. Expenditures on new equipment fell 3.5% in the second quarter and is down nearly 2% over the last year. Spending on structures was down 7.9% in the quarter and 7% over the past year. Labour productivity is stalling. Even home purchases are falling, with residential investment down 6.1% in Q2 2016. As I have pointed out on numerous occasions, US business investment is responding to a fall in corporate profits, down for five consecutive quarters. The latest estimates from FactSet suggest that earnings for the top 500 US companies will decline on a year-over-year basis in the third quarter as well, which would mark the six straight quarter of declining profits. With sales falling, executives are doing what they can to protect margins by slashing spending and cutting inventories. According to the economists of investment bank JP Morgan, global growth was just 2.2% annualised in Q2 2016, well below the forecasts for this year made by the IMF. The IMF expects 3.1% growth this year and 3.4% growth next year. JPM and the World Bank are closer in their estimates, with the latter now expecting just 2.4% global real GDP growth this year. Most economists reckon that when global growth is at 2.5%, the world economy is at ‘stall speed’, meaning that it would drop into recession from that level because investment and consumption growth would collapse. But all is not lost, it seems. In the month of July, there seems to have been some slightly better data. Business activity surveys called purchasing managers indexes (PMIs) for July rose. JPM estimates that the global PMI rose to 51.4 in July from a low of 51.2 in May. That is supposed to mean that global growth has stopped slowing because actual real GDP growth closely follows the global PMI. 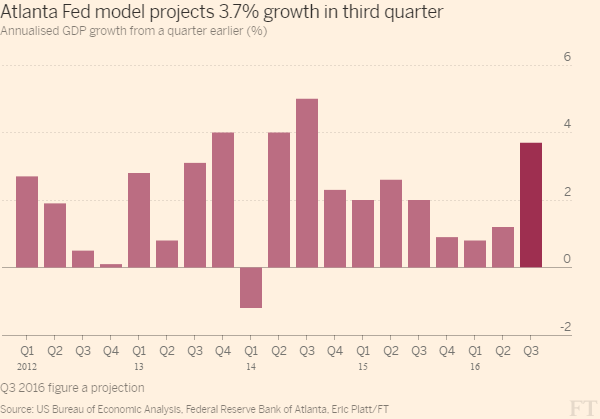 And the closely followed Atlanta Fed growth forecasting model currently reckons US economic growth will rebound in the current quarter ending at end-September. Former chief economist for Goldman Sachs, Gavyn Davies now runs an economic forecasting firm, called Fulcrum. Fulcrum also claims that things are looking up with global activity expanding at an annualised rate of 4.1 per cent, a marked improvement compared to the low point of 2.2 per cent recorded in March. So far from ‘stall speed’, the world economy could be “achieving escape velocity, in which the recovery becomes self-propelled, without needing repeated doses of monetary and fiscal policy support to prevent a renewed slowdown”. Davies admits that “the global economy has been growing at below its trend rate of 3.8 per cent per annum on an almost continuous basis since 2012, with only a few brief periods of slightly better performance”, but things could be about to change. Why should this happen? Well, JP Morgan economists reckon that business investment and profits are closely correlated – “both business confidence and profit growth are highly statistically significant in explaining capital spending.” JP Morgan reckons that business spending “is less a function of borrowing costs than of an assessment of the outlook and profitability. On balance, this model explains 70-85% of the variation in business equipment spending growth”. JP Morgan admits that business investment and profits growth are “currently quite depressed” but if GDP growth picks up and commodity prices do also, then there could be a “turn-up in the profits cycle”. And that would lead to an investment recovery, and with it, faster economic growth. But wait a minute. Economic growth is going to speed up because investment is going to speed up, because profits are going to rise, because economic growth is going to speed up. There appears to be a circular argument here. While JP Morgan’s economists have recognised the high correlation between business investment and profits, they have failed to identify the causal direction. As I have argued before, the Keynesian-Kalecki view is from spending (consumer and investment) to profits and wages, while Marxist view is that it is from profits (and exploitation) to investment and then income, employment and spending. Getting that direction right is essential to understanding the trajectory of the capitalist economy. Corporate profits are falling in the US, Japan and Europe – and so follows business investment. Unless that changes, the major economies are more likely to contract, not speed up. Optimism could be dashed again. This entry was posted on August 4, 2016 at 6:25 pm and is filed under capitalism, economics, Profitability. You can follow any responses to this entry through the RSS 2.0 feed. You can leave a response, or trackback from your own site. The pick up in US personal consumption expenditures is a bit of a mystery. Car sales are down, take-away sales are down, apparel sales are down, holiday travel sales are down, grocery sales are down, higher end property sales are down. I suspect that consumer spending will be marked down resulting in a downward revision of Q2 GDP. Unless of course all the money pouring out of China is buoying up consumer spending in the US and elsewhere. Its not a mystery. The economy was always going to recover in the second half once the oil blip was out of the way. Sure, it was always going to recover, which explains why US corporations have reported the 4th straight quarter of shrinking profits and tepid sales. With 2/3 of the companies in the S&P 500 reporting quarterly results, profits are estimated to have declined 2.6% on a year over year basis. What was it Bush said to the soon to be ex-head of FEMA after Hurricane Katrina? “Helluva job you’re doin’, Brownie”? Yeah, helluva recovery you got goin’ there, Billy. We are not in ‘normal’ conditions, no matter how many times jeffries tries to repeat the claim. ******Note Well******* This doesn’t mean that I expect a catastrophe. Reblogged this on 21st Century Theater. With most major economies slowing down and or receding, some see India as the next ‘growth engine’. How far do you think this optimism is well founded ? Would India really become the next China ? To me corporate profits and capex in a downtrend for well over a year now implies overcapacity. Put together with inventory overhang and the catalysts for improvement in either are just not there. Considering that interest rates can no longer go materially lower, the only way for corporate profits to go up is via cost-cutting. Which will of course cut business capex further and hurt PCE as well. But a shorttermist might consider the train headlights in the tunnel as an exit. Maybe Amazon is having an economic meltdown. I’ve had Michael Roberts’s new book on order there since he first mentioned it, but so far there is no sign of it even being dispatched. Sad.